Wisdom teeth or tooth ( also called Third molars ), are the last teeth to grow in the mouth, usually they start erupting at late teens or early twenties. When a wisdom tooth has no place to grow in the mouth, it will only emerges partially, than a flap of gum, called Operculum, may form a pocket over the tooth which makes the tooth cleaning very hard. If a pieces of food get inside that pocket this might lead to An infection, called pericoronitis , and this will be associated with swelling of that gum, sever pain and may be a mouth opening restriction. 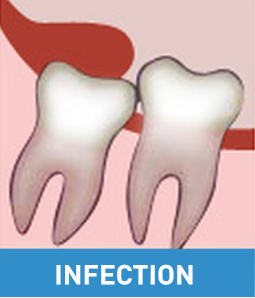 If the wisdom tooth was not taken out, this infection will be repeated for couple of times. So, wisdom teeth that potentially causing problems, like infections, need to be removed. Extractions can range from a single tooth, or removing all the four wisdom teeth at once based on the preference of the doctor and/or the patient. 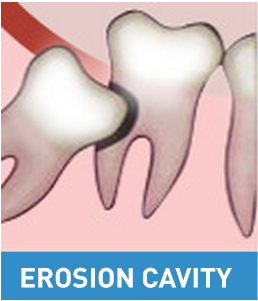 The surgery can performed under normal local anesthetic to numb the areas where the teeth will be extracted. Others if you prefer to take all of them in one go you have to go under a general anesthetic. Also the inability of wisdom tooth to grow means it is Inclined in the bony jaw and by this it might affect the neighbour tooth leading to Erosion Cavity.